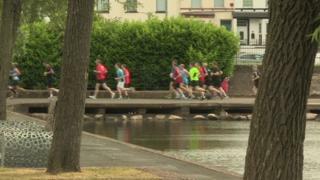 Hundreds of people have taken up exercise in Northern Ireland thanks to the popularity weekly 5k runs. The parkruns take place on Saturday mornings at a number of locations, and are helping promote an healthier lifestyle. Letitia Fitzpatrick reports on how runners and their families have helped transform the waterworks area in north Belfast. Visit the Get Inspired guide to running.